I faintly remember being confused about the trade. Just before Opening Day of the 1986 baseball season, the Yankees and Red Sox exchanged DH’s. New York sent Don Baylor to Boston for Mike Easler. Later on, I learned that Baylor had demanded to be traded because Lou Piniella, the Yankee Skipper at the time had announced he intended to platoon him with Ken Griffey during the ’86 season. As is the case still today, trades between the arch-rival franchises were not frequent occurrences. In fact the Easler for Baylor deal was the first trade between the two teams since New York got Sparky Lyle from Boston in exchange for Danny Cater fourteen seasons earlier. I could only hope that this deal would end up being as one-sided in favor of the Yankees as that one was. it wasn’t. In 1984, Easler had belted 27 home runs for Boston, driven in 91 and averaged .313. Even though all those numbers decreased the following year, there was a lot to like about Easler in pinstripes. He was a bonafide three-hundred hitter who’s nickname was “Hit Man.” He was a left-handed hitter with good pop in his bat which I hoped meant perhaps 25-to-30 home runs per season aided by Yankee Stadium’s short right-field porch. 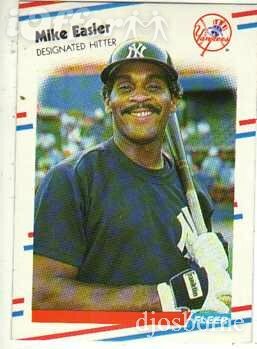 Easler would be joining a Yankee lineup that included superstars Don Mattingly, Ricky Henderson and Dave Winfield. There would be lots of protection surrounding him in the batting order which also meant less pressure to produce in every at bat. I fully expected that Yankee team to win their Division. They came close, winning 90 games but Boston, with plenty of help from Baylor (31 HRs and 94 RBIs) won 95 and ended up in the World Series. Easler did hit .302 for New York but he managed just 14 home runs and 78 RBIs. But offense was not the problem for the 1986 Yankees. Instead, starting pitching was their achilles heel. It was a case of Ron Guidry and Joe Niekro being too old and Doug Drabek and Bob Tewksbury not being old enough. The Yankees traded Easler to the Phillies for pitcher Charles Hudson that December and then got him back in another trade the following June. He played his final 65 big league games in Pinstripes during that 1987 season and then gave Japanese ball a try. During his 14 season career in the Majors, Easler hit .293. The Hit Man shares his November 29th birthday with this former Yankee outfielder , the greatest Closer who ever played the game and this one-time Yankee phee-nom.